I wanted to have an adventure. She wanted to travel by train. So we compromised. At least that’s what I like to tell myself. The trip I took with my wife through the Canadian Rockies was absolutely amazing, and I’ll graciously admit that this was one argument I was glad to have lost. When considering a trans Canadian adventure there are lots of possible journey’s, but only one possible response: Wow. No matter which trip you choose, I guarantee you’ll sit nose pressed to the window as you’re transported through a world like no other. A world of magnificent coastal mountains, vibrant canyons, and daring white water rapids. Oh and rest assured, they clean the windows thoroughly after each and every trip! Canada train. We landed in Vancouver, BC and rushed over to the station. We had scheduled our flight to arrive only a few hours before boarding commenced for the train, and of course, we were delayed. So when we did land we had to make haste. Our route was to take us through scenic valleys, the Coastal Mountain Range and the Fraser Canyon with its spectacular white water and dramatic landscape. A highlight was to be the majestic Mount Robson, the highest peak in the Canadian Rockies. Travel through Canada by train. This is an account of our experience exploring the Canadian Rockies by train. There are two “services” to consider when booking a train journey with Rocky Mountaineer – GoldLeaf or SilverLeaf. At every service level, Rocky Mountaineer hosts attend to your needs. They will welcome you with a morning toast, serve up delicious meals and entertain you with interpretive storytelling. The car we rode in was the GoldLeaf bi-level coach, with an eating area downstairs and a wonderful viewing dome up top. “I want one,” my wife said to me in regards to the train car. I agreed! Rocky Mountaineer review. The ride up to Kamloops was spectacular. We traveled side by side with the Fraser and Thompson river, Canada’s largest salmon route. You really feel the enormity of the land. We then swept north bound. Though it was difficult to decide whether we focus our attention on the stunning scenery or the cuisine! The GoldLeaf bi-level coach, with an eating area downstairs and a wonderful viewing dome up top. It was difficult to decide whether we focus our attention on the stunning scenery or the cuisine! We got off the train in Kamloops and stayed the night at the Hampton Inn. Hotel options are offered for each level of service, and you have the flexibility to change or upgrade your hotel experience as desired. The following day the train slowed as we passed Craigellachie, where the last spike of the Canadian Pacific Railway was driven. We climbed over Rogers Pass, Kicking Horse Canyon, the Spiral Tunnels and, of course, the glaciers and snow-capped peaks of the Canadian Rockies. Train travel in Canada. On arriving in Banff, we disembarked the train to explore the surrounding area. Being a bit of a history buff, I dragged my wife to the Banff Park Museum. 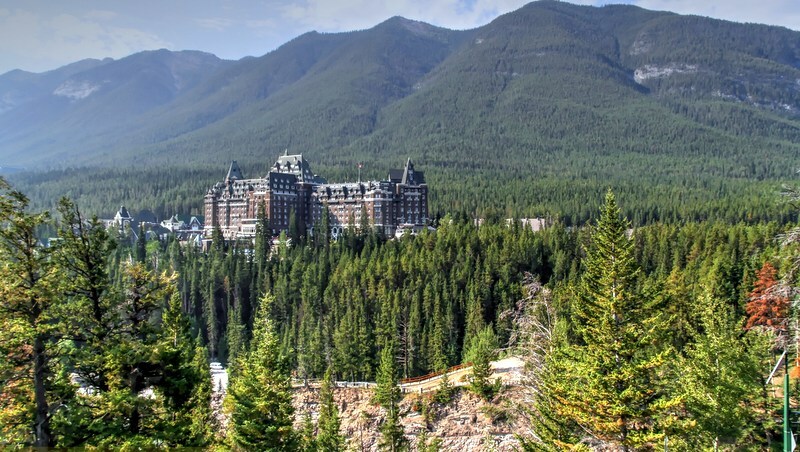 In return, she made us stay at the stunning Fairmont Banff Springs hotel for the night. A little costly, but well worth every penny. As they say, marriage is all about compromise! What it’s like to travel around Canada by train. On our third day we were ferried to Jasper in a motor coach for an Icefields Parkway tour. We didn’t believe it possible, though the scenery only continued to get better. Best train journeys in Canada. Canadian rockies by train. This was a full day sightseeing tour that traveled through a landscape carved by glaciers and opened by pioneers. It is rated as one of the most scenic highways in the world for the ability to marvel at glaciers remaining from the last ice age. Our fourth day allowed for half a day exploring Jasper before boarding the Via Rail train to Toronto. While there are many ways to spend a day in Jasper, we opted for the Glacier Skywalk. Train trips in the Canada Rockies. Our feet seemed to float on the glass floor that juts over the Sunwapta Valley, the wind rising as the river rushes far below. 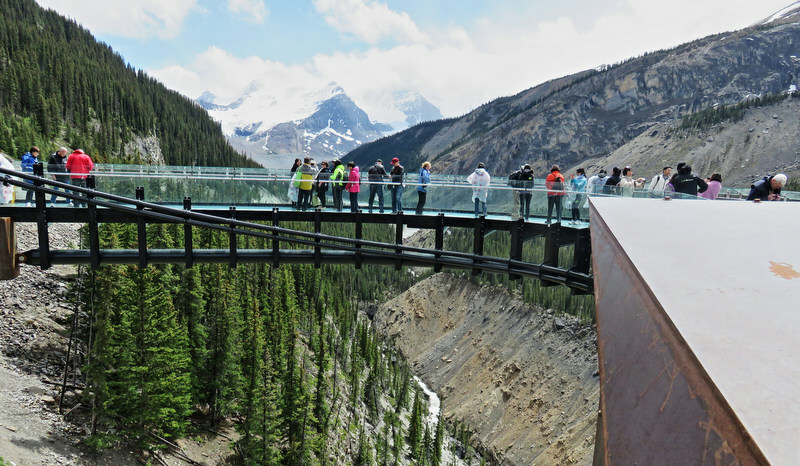 Overlooking mountains and glaciers, the Glacier Skywalk is an hour south of Jasper, and the views are beyond words. Best train trips in Canada. Travel through Canada by train. The sheer variety of terrain we saw from Jasper to Toronto was just as wonderful as the climb through the Canadian Rockies. From the plains of Saskatchewan to the lakes of Ottawa, the four day train ride was spectacular. The area around Sioux Lookout was especially beautiful, and we recommend organizing a stop there to play in the lake. Train travel in Canada. We had less than two days to spend in Toronto, and while the largest city in Canada requires a vacation all it’s own, it’s definitely possible to fit a lot in if you’re short on time. What are Canada’s best train trips. The CN Tower was a highlight, though once we reached the observation deck, I about had a panic attack. I am only mildly afraid of heights but with a view 342 m (1,122 ft) straight down, even those not afraid of heights might need a little help when it comes to the Glass Floor. See Canada by train. Think you can handle it? Wait till you get here and see if you feel the same way. Pro Tip: Save 42% off admission to Toronto’s 5 best attractions, including the CN Tower with Toronto CityPASS, plus skip most ticket lines! Buy online now or onsite at the CN Tower the day of your visit. The next morning we packed our things, ate breakfast in the hotel and headed over to the airport. With a heavy heart we boarded the plane heading home and with one last look said goodbye to Canada (for now). Max is a creative writer at heart, now trying his hand at the world of blogging. 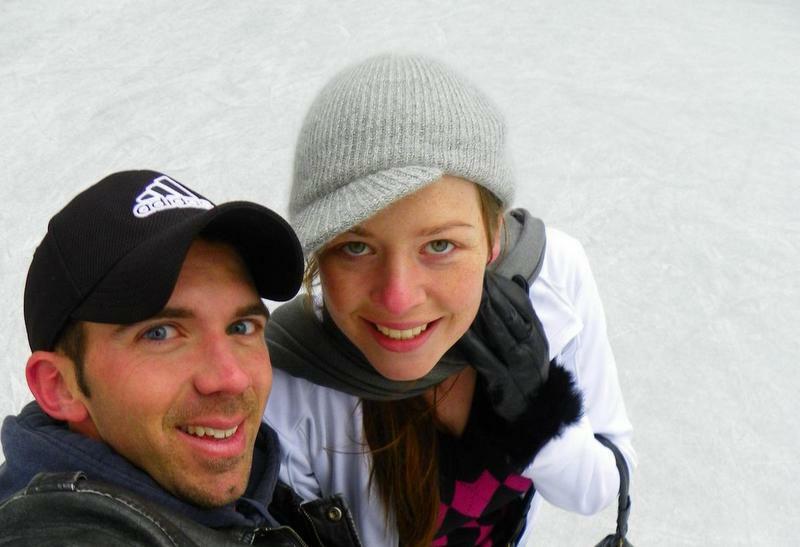 Together with his beautiful wife Heather he has twin sons named Rob and Zac. Follow Max on Twitter at @Max_Augustine1. Photo credits: Featured photo by Juliane Schultz. Pinterest Images by James Wheeler & Juliane Schultz. Rocky Mountaineer Gold Leaf bi-level Coach & Cuisine; both photos by Mark & Andrea Busse. Fairmont Banff Springs hotel at a distance by canterbury. 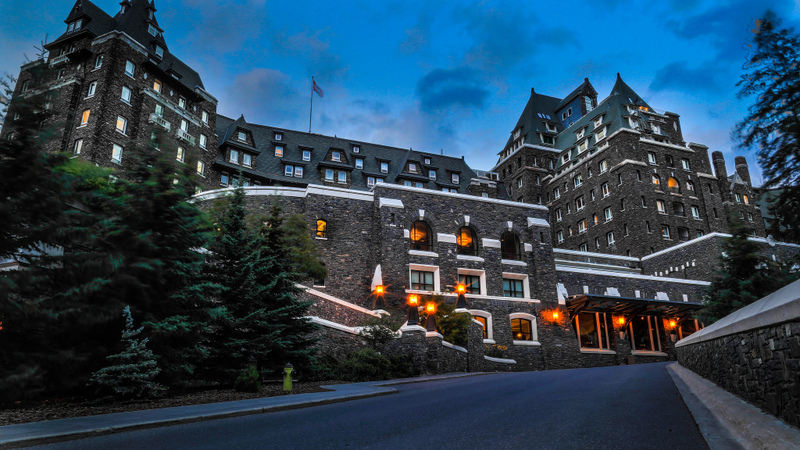 Fairmont Banff Springs hotel at night by Gregg Jaden. Jasper Glacier Skywalk by Kenneth Cole Schneider. Haha and the CN Tower, if you’re game for it, is definitely something you’ll remember! I’ve only done short train rides so I definitely want to try something longer. Hope you have the chance to visit soon Deb! Holy crap, I want to be in that kind of train! Hope you have the chance to visit Canada and book onto the Rocky Mountaineer soon! Europe has a fantastic system of trains – one of the most efficient transportation set ups I’ve experiences. Really loved traveling through Switzerland by train while in Europe. I imagine the Canadian Rockies would hold many similarities to that journey! I love train journeys and would totally enjoy a trip like this one. I’m pretty sure the Glacier Skywalk would make me very dizzy- a glass bottomed floor sounds terrible for my fear of heights. It’s definitely enough to give you the heeby jeebies that’s for sure!! A little weak in the knees lol and not necessarily in a good way :D But the views are totally worth the weak knees and momentary fear!! I’ve heard a LOT of great things about the Canadian Rockies — well… the whole of Canada in particular and this just makes me want to book a trip there soon! Hopefully next year though since my 2016 is already somewhat full. But for sure, I’ll be taking that train trip! Train travel is one of the best ways to maximize the amount of the country you’re able to see, so this is a great idea if you’re excited about the whole country at large. Happy travels in 2016 … maybe we’ll bump into you in Canada next year on the train! The train looks much more impressive than the ones I’ve been on! Looks like a great adventure. Definitely need to get up to Canada to do some exploring. This is one of my bucket list items. Hoping to do this with my husband next year for our 25th anniversary. Banff has been on my radar for 25 years so only fitting I should see it then. ;) Nice post, great photos. Glad you enjoyed the post Melody. Happy anniversary for when it comes up! Nothing beats a glass roof and huge windows, that train car looked fantastic. I have to say I love the names of Canadian places too, Rogers Pass, Kicking Horse Canyon! I never thought of Canada as that much of a Picturesque place, but this definitely proved me wrong! They do have quite a number of unique and catchy destination names! And I can promise you that Canada can be one of the most picturesque countries on the planet if you make your way to the right places. Banff for one has landscapes and lakes that appear to be out of a dream! Train is definitely a wonderful way to explore a country. Canada certainly provides a treat for those who like to travel by train. By the way, it’s great that you’re able to laugh about the compromise in Banff. I think this train journey has to be one of the best in the world as far as a bucket list goes. Canada definitely has the landscapes to make it special! This looks a little different to the trains I’ve used before – Europe was an OK Standard but Asia.. well, they were functional! The Canadian Rockies have always interested me and to travel on the Rocky Mountaineer would be amazing – the glass ceiling being a major highlight! The Rocky Mountaineer will definitely set a high standard re what you expect from trains in the future!! I did enjoy the train system in Europe, though mainly for it’s cleanliness and efficiency. It was more of a way to get from A – B with the added bonus of awesome scenery interspersed. This on the other hand is a bucketlist journey in it’s own right! One of the most beautiful spot in the world. The train looks like a great way to travel through the region. Amen to that! It really is a very blessed region in terms of natural scenery. Some of the best in the world! And what better way to experience it than by train with a glass top roof :D! For those who do not want to pay the high fares on the high fares on the Rocky Mountaineer, you have an alternative. Via Rail Canada runs far less expenively from Vancouver to Jasper National Park though very nice Scenery. From Jasper take a bus with photo stops to Banff National Park along the Icefields Parkway, one of the most scenic routes in the world. Simply awesome. From Banff, you can return to Vancouver by Greyhound (first sure to leave in the morning for great scenery in even more national parks) or return to Jasper to join Via Rail on your onward trip to Toronto. I don’t mean to discourage anyone who can afford it from taking the Rocky Mountaineer. Its route from Vancouver to Banff is simply sublime and its train overnights midway so you don’t miss any scenery. Thanks for the budget friendly tips Don! Fantastic to know that there are cheaper alternatives out there for those who might not be able to make the Rocky Mountaineer work. Does it cater for singles? Hi Jan, solo travelers can definitely book the Rocky Mountaineer – the advertised fares are generally per person assuming 2 people travelling together, so solo travellers will usually pay a single supplement (which will vary depending on the tour you choose). Sound like a wonderful journey. Do you have option of staying extra nights at each destination? Also how long do you travel on each leg of the journey? Hi Amanda, if you’re looking to spend more time in specific destinations you can mix and match a couple of different train routes to create your perfect journey But each itinerary in itself has a set trip length so you couldn’t, for instance, book a 30 day trip and decide to stay longer in one spot. For that you could book a couple of different shorter itineraries and organize a hop on hop off scenario where you spend a few days before picking up the next. How long you travel on each leg will really vary depending on the specific itinerary and route you choose – there are a lot of different options, and it depends which cities you’ve chosen to jump between. While I cant say i’ve ever taken the Rocky Mountaineer i will say that Jasper/Banff and the Rockies are absolutely stunning and if you’ve ever given the opportunity to visit them to do so! I typically prefer to explore the area by rental car as I can get away from the crowds to some of the less seen areas and get some amazing photos! Because the Rocky Mountaineer has become quite expensive even for its economy-class seating, here are some alternatives. The Mountaineer’s route from Vancouver to Banff is the most scenic. Via Rail Canada has much less expensive economy (no sleeper) fares from Vancouver to Jasper, which even include high-level dome seating on a first come first served basis. Via Rail also has an upper and lower berth option for sleeping, which costs considerably less than its cabins. However, as mentioned, the Via route, though very scenic, is not as good as the Banff one. Moreover Via Rail does half the route at night. There is bus service from Jasper to Banff, which is utterly sublime, as Megan described. During peak hours of light during summer, Greyhound Canada travels the Banff route in daylight leaving around 6:30 a.m. This travels nearly the same route as the Mountaineer. From Banff you can board a bus for Jasper and then either return to Vancouver using Via Rail or go on to Toronto using Via Rail, as Megan did. If you continue on to Toronto, note that Via often arrives notoriously late– more than 24 hours late once this year. Please don’t schedule any onward flights from Toronto until you’ve stayed at least two nights. Note also that the Greyhound Internet fare from Vancouver to Calgary is often very much cheaper than its one to Banff. If you do not check luggage you might consider getting off at Banff using the Calgary fare. I am not guaranteeing, though, that this will not get you into trouble somehow. Also, only very small bags can taken onboard (less than on airlines) and certainly not backpacks. Years ago I worked for a Vancouver “inbound” (mostly Australasians, British, European, and Irish customers) travel and tour company that specialized in the Canadian Rockies. You will love it! 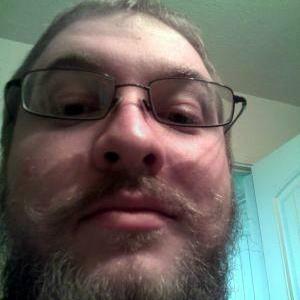 Hi Don, thanks for sharing your knowledge and such valuable tips. Great to know that Via Rail Canada has much less expensive economy fares, but yes, it’s definitely something to consider if half the route is overnight, especially since the scenery is the biggest part of the experience. I love that Greyhound Canada leaves around 6.30am, means you can take full advantage of the sunlight in witnessing the landscapes outside. I think the bus and then returning using Via Rail is a great way to go. Thanks for the heads up on via arriving late in Toronto – wow, 24 hours late is a HUGE delay! Duly noted re scheduling flights! Really love those fare quirks where it’s cheaper to get the ticket to a destination further away, but jump off during a stopover. I’m sure they don’t love you doing it, but follow the savings right! Thanks for sharing such inside tips! Thank you so much, Meg. Read your post very carefully, but somehow skipped over your name and gave Megan all of the credit! Am sorry for that! One thing I didn’t mention is the acute accommodation shortage in both Banff and Jasper during peak summer season. It’s not good to arrive without at least the first night booked even for camping. An advantage of using the Rocky Mountaineer company is that it has arranged blocks of rooms that it can book for its passengers. Utterly brain dead here. Meant Max, not Meg. Hi Don, no worries! We’re always happy to accept articles from guest authors about places of the world we haven’t been yet. Inspires a longer bucketlist! Another great tip about pre booking accommodation – yes, pre-booking rooms in a destination as popular as Banff and Jasper is a must, otherwise it gets ridiculously expensive when there are only a few rooms left – or you get stuck without one at all. I think a lot of people are surprised to hear that this applies to camping too. You can’t just rock up! As you’ve said, the nice thing about a group tour like the Rocky Mountaineer is that they usually get group rates at each hotel within their blocks, so inclusion in a rail package is probably a better deal than you would get otherwise. Am sorry to report that the Greyhound Canada service I mentioned above between Banff National Park and Vancouver will be discontinued after the 31st October 2018. All Greyhound service in western Canada will end due to loses. Not known at this time is what will replace it and when. You can still reach Vancouver by Amtrak.com (rail service), BoltBus.com and Greyhound.com from points in the United States and by ViaRail.ca from points in central and eastern Canada. I’ll watch the space to see if anything steps in to take it’s place.